MIT Hexacon 2013 World’s First Hexapod Conference (includes dance-off!) « Adafruit Industries – Makers, hackers, artists, designers and engineers! MIT Hexacon 2013 World’s First Hexapod Conference (includes dance-off!). 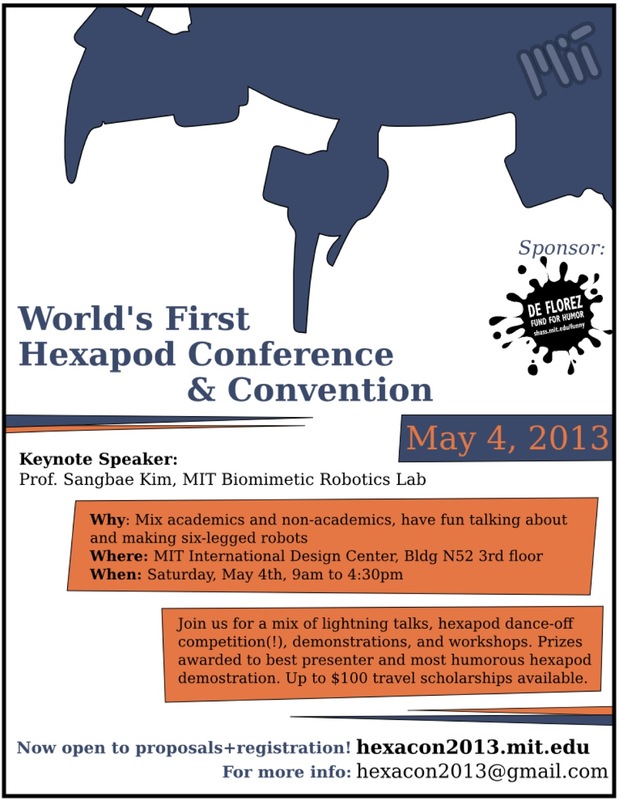 The world’s first Hexapod Conference and Convention will be held on May 4th, 2013, at the Massachusetts Institute of Technology, and we are accepting proposals for talks, workshops, and demonstrations. The aim of this conference is to foster relationships between academics and non-academics working on hexapod (six-legged robot)-related topics. Additionally, a major aim of this convention is to have a lot of fun, especially since this conference is made possible by the DeFlorez Humor Fund. Hexacon will take place at the MIT International Design Center on the third floor of building N52, right next to the MIT Museum. There will be a prize for the most humorous hexapod demonstration as well as the best presenter.